A couple years ago my sister in law gave us a DVD that soon became one of our favorites to watch. Oy Baby was like Baby Einstein for Jews and we lapped up the great music and awesome visuals. C loved it all, the songs, the babies dancing, even the puppets. Sadly it wasn't exactly the baby gift we could get for all our friends. You know, because not everyone is Jewish or is really into the whole Judaica scene. But the brilliant people who brought us the Oy Baby joy created another awesome CD/DVD combo that will appeal to the masses. 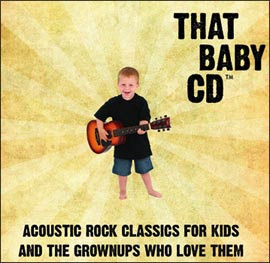 That Baby CD is a collection of covers of popular songs. My personal favorites are the Happiness Runs/Circle Game medley and Springstein's Pony Boy. The DVD sets the songs to mesmerizing images and scenes of children playing, like Baby Einstein, but way better. Our 3 year old and 1 year old were both entranced. So if you're looking for a unique baby gift or an original pre-schooler birthday gift, look no further. Trust me, you won't be sad you picked this up. Special deal for my readers: Use JessicaSentMe as a coupon code and get 20% off. Now go forth and do even more rocking out! Remember that funky show with those huge singing and dancing animals from the 60s? Yeah, me neither, but that's OK! Because they're back and now we get to discover The Banana Splits right along with our beloved kiddos. 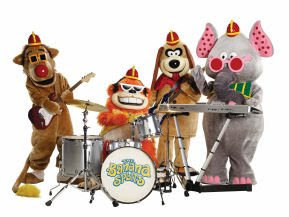 Starting September 2, The Banana Splits are going to star in their very own comedy shorts and music videos on Cartoon Network. Now I know you're thinking that the last thing we need is more grown-ups dressed in funky animal costumes singing and dancing around a stage. But trust me these guys are no Barney. The music is good and the shows are actually goofy funny. Well, funny if you're 5. But the music really is good! Honest! You really don't believe me? Despite all the good kid music advice I've given you? Fine, be that way, but you can go hear them here for yourself on the as yet not launched site, you lucky dog. And take your kids with you because they have games, videos, and jokes that they are going to love. Go forth and rock out. Or as C loves to say "Less talkin', more rockin'!"